Troy, N.Y. — A comet strike may have triggered the Paleocene-Eocene Thermal Maximum (PETM), a rapid warming of the Earth caused by an accumulation of atmospheric carbon dioxide 56 million years ago, which offers analogs to global warming today. 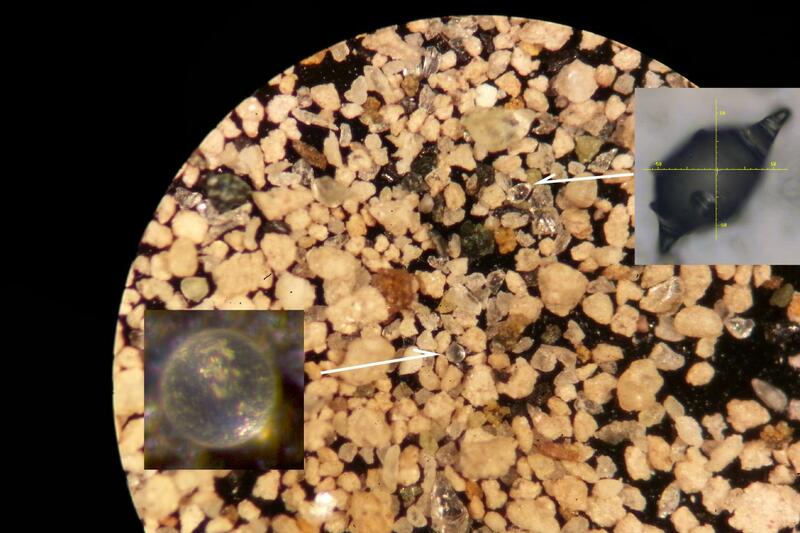 Sorting through samples of sediment from the time period, researchers at Rensselaer Polytechnic Institute discovered evidence of the strike in the form of microtektites – tiny dark glassy spheres typically formed by extraterrestrial impacts. The research will be published tomorrow in the journal Science. "This tells us that there was an extraterrestrial impact at the time this sediment was deposited – a space rock hit the planet," said Morgan Schaller, an assistant professor of earth and environmental sciences at Rensselaer, and corresponding author of the paper. "The coincidence of an impact with a major climate change is nothing short of remarkable." Schaller is joined in the research by Rensselaer professor Miriam Katz and graduate student Megan Fung, James Wright of Rutgers University, and Dennis Kent of Columbia University. Atmospheric carbon dioxide increased rapidly during the PETM, and an accompanying spike in global temperatures of about 5 to 8 degrees Celsius lasted for about 150,000 years. Although this much is known, the source of the carbon dioxide had not been determined, and little is known about the exact sequence of events – such as how rapidly carbon dioxide entered the atmosphere, how quickly and at what rate temperatures began to rise, and how long it took to reach a global high temperature. As a source of fossils, the team used sediment cores – cylinders of sediment extracted vertically from sediment deposits with a hollow bit – known to correspond to the time period of the PETM. Sediments near the top are more recent, those further down are older, and signature layers indicating known events are used to calibrate the timescale represented in the sample. The team chose cores from three sites – Wilson Lake and Millville in New Jersey, and Blake Nose, an underwater site east of Florida – known for a rich sedimentary record of the time period. Once the team made the discovery, they obtained a sample from a fourth site – Medford – where the unit is naturally exposed at the surface, to rule out the possibility that the samples had been contaminated by the drilling process. The Medford samples also contained microtektites. Research at Rensselaer fulfills the vision of The New Polytechnic, an emerging paradigm for higher education which recognizes that global challenges and opportunities are so complex, they cannot be addressed by even the most talented person working alone. Rensselaer serves as a crossroads for collaboration — working with partners across disciplines, sectors, and geographic regions, to address global challenges — and addresses some of the world's most pressing technological challenges, from energy security and sustainable development to biotechnology and human health. The New Polytechnic is transformative in the global impact of research, in its innovative pedagogy, and in the lives of students at Rensselaer.